I thought I'd talk a little about what a common day of Paleo-based eating is for me. Several staples of my daily routine have really helped me feel awesome and could potentially be of great use to other people looking to boost their bodies and minds. Today's post will be about my morning routine. I also wanted to post links to good sources of information on each point--put things in a larger context, and give you the tools to make your own decisions. Finding the healthiest diet/lifestyle/attitude is a personal journey that we all make individually, but by sharing my daily routine I can at least tell you about mine. Like what's worked for me, and why I've made the decisions I have. Good luck in finding and following your own path! 1. Immediately upon waking up I take a gram of sea salt. You can do this by mixing it with water, or just eating it. Salt has been shown to be really good for your adrenal system, and by taking it right after you wake up you don't burn as much cortisol early in the day, leaving more for energy throughout the day. Salt has been demonized because of its (inaccurate and not correlated) connections to high blood pressure and heart disease, but it's been shown that when included as part of a healthy diet, salt is not only good for you, it's essential to stress and other functions. Himalayan sea salt is the purest in the world. 2. I take Vitamin D. Vitamin D should be taken in the morning, and almost the more of it you have the better. It's involved in so many essential processes in the body, that it really blows almost any other supplement out of the water if you're just starting to supplement. You can be within a "normal" range for Vitamin D on a blood test and still benefit greatly from supplementation--and most people are deficient from sunlight alone, except maybe in very sunny climates. The Vitamin D Council recommends 1,000 IU’s per 25lbs of body weight, but using a blood test is the best way to determine your ideal dose. I take 5,000 IU every day. Dave Asprey has recommended Nutrigold Vitamin D3, which you can get pretty cheaply on Amazon. 3. 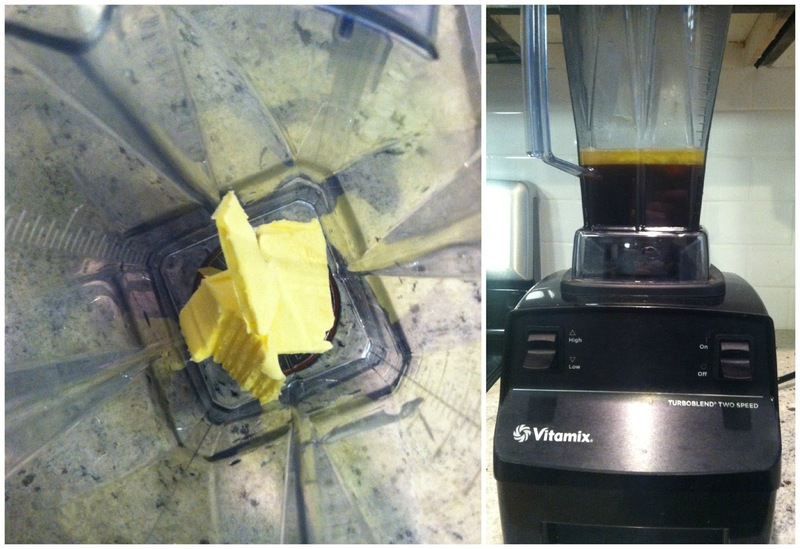 I make a big mug of Bulletproof Coffee with unsalted grassfed butter and MCT oil. Healthy fats are a staple of any good Paleo-based diet, and this cup of coffee in the morning really packs a wallop. I totally understand being skeptical about putting butter in your coffee, but when it's clean, unsalted and good coffee, blended up and foamy, it's soooo good. We use single-origin, 4,000 foot elevation South American, low-toxin, washed coffee beans from Happy Cup Coffee. I talk about how I make it and a bunch of the benefits in this post, so check that out for the whole story! We need fat to build every cell in our bodies and brains, and running on pure, clean fat in the morning keeps your body in a ketogenic state (burning fat). When you consume healthy fats from grassfed animals and medium chain triglycerides (MCTs) derived from coconut oil, you feel energized for hours, it's amazing. Everything feels like it's working well and by replacing grain-heavy breakfasts with nutrient-dense fats, your body will also start correcting itself to your optimal weight. 4. After I have my coffee and read the paper but before I get to work, I've started meditating to reduce stress and anxiety, every morning. Usually that's it for my morning routine and I'm good until lunch! You'd be surprised how filling the coffee is, but sometimes I will also have some eggs, or something with almond butter and coconut oil if I feel like I want something more in my stomach. Have you found a great morning routine that helps you perform at an optimal state, and get you off to a good start? I'm not sure I could do the sea salt plain thing, but I do like adding ALL the salt I want to things, knowing it's good for my adrenal system! Great collection of links, will have to read them sometime! I have been trying to remember to take my vitamins in the am and D is one of them. I also take iron and a B complex. As an endurance athlete salt is super important for me to make sure to take in.